My baby boy loves trains, so for his 2nd birthday, I decided to make him an extra special birthday cake! A 3D train cake! 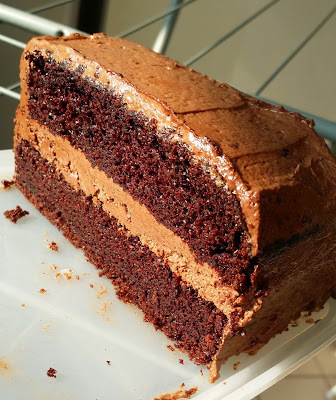 I used a devil's food cake for the cake base instead of the usual sponge cake as I love a good, rich chocolate cake. I experimented with a few different recipe and this (original recipe from Ina Garten) is definitely THE jackpot! It's so rich, chocolaty, moist and yet not too sweet. PUUURFECT! 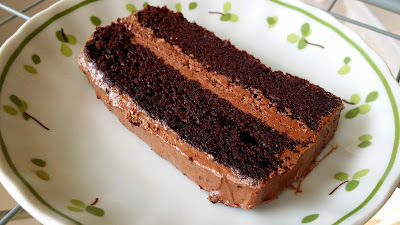 For the frosting, I love the Swiss Meringue Chocolate Buttercream I used the other time, so I'll just stick to it. Preheat the oven to 180 degrees C. Butter two 8-inch x 2-inch round cake pans. I used 1 9-inch x 9-inch square cake pan. Line with parchment paper, then butter and flour the pans. Cool in the pans for 30 minutes, then turn them out onto a cooling rack and cool completely. Since I'm using one big pan, slice the cake into 2 and frost accordingly. Place 195 egg whites and 220g granulated sugar in a heatproof bowl. Sit the heatproof bowl on a saucepan filled with water. The base of the bowl should not be in contact with the water. This is known as a double boiler. Bring the water in the saucepan to a slight simmer. Use a balloon whisk and stir the egg whites and sugar constantly until the sugar has fully dissolved and the mixture is warm to the touch (test by inserting your finger). Remove the heatproof bowl and beat the warm egg white mixture on medium high speed to obtain stiff peaks using an electric beater. (It takes a longer time when sugar is added.) At stiff peaks, the beaten egg whites will not budge when bowl is overturned. When the beaters are lifted from the beaten egg whites, the surface of the egg whites should form stiff upright peaks (not drooping peaks). The beaten egg whites should be cool to the touch (room temperature), not warm like when it was removed from the saucepan. Lastly, sift in 100g cocoa powder and continue beating to obtain a smooth chocolate buttercream. If you are making the cake a day ahead, just cool the cake completely, wrap it up carefully in cling film and keep in the fridge. After cake has been frosted, and there are leftovers, don't worry, just keep in a airtight container and keep in freezer. It can keep for up to a week! The cake is best eaten at room temperature, so just leave it on the table for a few hours and it's ready to be served with a glass of milk or a cup of coffee. If you love chocolate cake, you will love this recipe. Try it. You won't regret it!